For the iPhone, we have the most amazing solution. Aside from being able to utilize the DoxOut app as a stand alone app with full functionality, we can actually use the iPhone as an office tool similar to the iPad. We know that this is not a likely solution for most of the people, but as we've said before, our technology is superior at giving choices to the users and fulfilling any user scenario. With that said, let us explain one of the user scenarios for the iPhone, like we've never seen before. 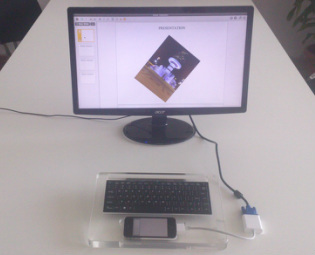 We have created a special housing out of Plexiglas, that fits a Bluetooth keyboard and an iPhone 4/4S. 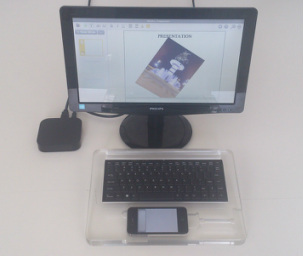 The screen of the smartphone is utilized as a mouse touch pad. In the left corner of the screen there is a big button, which is actually the mouse button. In this case, the users get a near laptop experience. The iPhone is connected to the screen wirelessly with an Apple TV. It can be connected with a standard VGA cable as shown on the picture bellow and the result will be the same. The functionality of the app is the same. The editing capabilities and sharing/collaborating features are the same. DoxOut will automatically detect unplugging from the display connecting cable. In such a case, the app will automatically transform into mobile mode, as shown on the picture on the far right.